One day, in the not-too-distant future, your braces will come off, or you’ll complete your sets of Aligners and the active phase of your treatment will come to an end. Now that you’ve made it through treatment and you have that brand new smile the next step is to make sure that it will last. We call this next phase: retention. Retention is a critical follow-through stage after you finish with your braces or Invisalign that is meant to keep your teeth in their new position. This typically involves wearing an orthodontic appliance called a retainer which will hold your teeth in place to preserve that new smile. There are several different kinds of retainers available and we will discuss the best option for you based on the particulars of your treatment. Retainers are custom-made just for you so they always fit comfortably. Dr. Kattner and his team will carefully review all the details of how to wear your retainer, how long it will be needed, and how to care for it when the retention phase of your treatment begins. But if your teeth are straight now, why do you need a retainer at all? Simply put, it's because if you don't wear a retainer your teeth will start moving right back to where they were! Now that your teeth are beautifully straight you don’t want to reverse any of the progress you made during treatment. The issue is that your teeth aren't set rigidly in the jawbone — instead, they're held in place by a network of fibers called the periodontal ligaments. After your orthodontic appliances have been removed, it takes several months for the periodontal ligament to adjust to the new position of your teeth and “lock” your teeth into place. Before the periodontal ligaments adjust, they’ll want to move your teeth back to where they were before. So if you want to keep that new smile — and not waste all the time, effort, and money it took to get it — it's essential to wear your retainer! Being fitted for a retainer usually happens on the same day your braces are removed. After your teeth are thoroughly cleaned we will either take impressions of your teeth or complete a digital scan. We then use the scans or bite impressions to carefully craft your retainer. A perfect fit is essential since it needs to keep your teeth exactly where they are. If you try on your retainer and it’s uncomfortable at all, let Dr. Kattner know, and adjustments to the retainer will be made if necessary. There are three basic types of retainers available today and each works best in particular situations. Dr. Kattner will evaluate which retainer is best for you when you finish with your orthodontic treatment. The most common retainer is the so-called “Hawley” retainer — a thin, tongue-shaped piece of acrylic molded to fit your mouth with a wire that holds your teeth in position. The Hawley retainer is simple, durable, and easy to wear. Your Hawley retainer will be crafted to fit comfortably in your mouth and it's even possible to personalize it further by choosing different colors and designs for the plastic portion that covers the roof of your mouth. It can also be used to correct minor tooth movements so your smile is always perfect. Another popular style of retainer is the clear aligner-type, which looks similar to the Invisalign® tray system. These retainers are custom-made of thin, transparent plastic which is designed to fit precisely over your teeth and be practically invisible, so no one we be able to notice that you’re wearing your retainer! These retainers are also easy to put on and remove, being molded perfectly to match your bite. 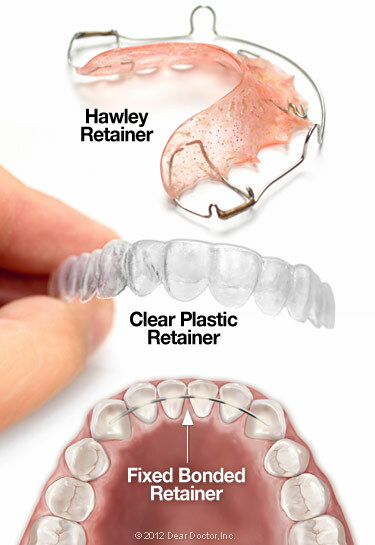 While the plastic they are made from is strong it is somewhat less durable than the Hawley retainer. They aren't recommended for patients with certain conditions (like teeth grinding). Fixed retainers are not removable like clear or Hawley retainers. We commonly use them for the lower front teeth after orthodontic treatment is completed. While they aren't removable by the wearer, they aren't visible either. Like lingual braces, this system uses a wire which is bonded to the tongue side of the teeth. We often leave them in place for years. Even though you’ve had braces or Invisalign for a while, wearing your retainer may take a little bit of adjustment. Some may find that they produce more saliva than usual for a day or so after first wearing any type of retainer. You may also find it a little harder to talk normally at first, but that problem will soon disappear. Of course, removable retainers should always be taken out when you eat or brush your teeth. At first, you will probably be told to wear your removable retainer all day, every day. This period of 24/7 retainer use generally lasts for 3 to 6 months. During this time your supporting bone and tissue are adjusting to the new position of the teeth. Eventually, Dr. Kattner will tell you that you can start wearing your retainer only at night. Just like when you were wearing braces or Invisalign, proper oral hygiene never stops being essential. To keep your new smile clean and healthy you need to make sure that you not only clean your teeth with regular brushing and flossing, but keep your retainer clean too! To clean a Hawley-type retainer or clear retainer you can use your regular toothbrush with a small amount of toothpaste. Just brush all around the retainer to clear away any food particles or plaque. You can also brush your fixed retainer like you would normally brush your teeth, and don’t forget to floss as well!. Some patients have found that a weekly cleaning with a denture cleaner is a nice supplement to daily brushing of your retainers. Finally, in order to prevent your retainer from being damaged or lost, use the retainer case provided by our office. You'd be surprised how many retainers end up folded in a napkin and accidentally discarded! Also, don't expose your retainer to excess heat by washing it in very hot water or leaving it in a really hot place - the plastic or acrylic of the retainer can warp making it unusable. With proper care and conscientious use, a retainer can help you transition from braces to a permanent, healthy smile. If you have any questions about post-orthodontic care with retainers just contact us; our team of orthodontic experts will be happy to help you. We are dedicated to creating new smiles for the families of Waukegan, IL and the surrounding areas. If you want a perfect, healthy, radiant smile, choose Kattner Orthodontics!